What is the most revealing fact about the Supra Launch 22 SSV? 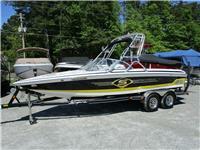 That's easy, it's the official wakeboarding boat of the WWA Wakeboard World Championships' amateur divisions. That tells us two big things. First, it's one of the sport's only tournament-tested 22-footers. Second, the Supra Launch 22 SSV's versatile wakes, which combine a solid transition with a pretty vertical lip, are Supra's easiest to ride. Combine those credentials with rider-friendly features like rear-facing seating for six and new, faster-filling ballast, and the Supra Launch 22 SSV is a solid choice for any wakeboarder - beginner to advanced. No wonder it's also Supra's best-selling wakeboard boat. 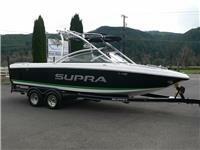 I am interested in your 2009 Supra Launch 22 SSV and would like more information. Please let me know. Thank you!